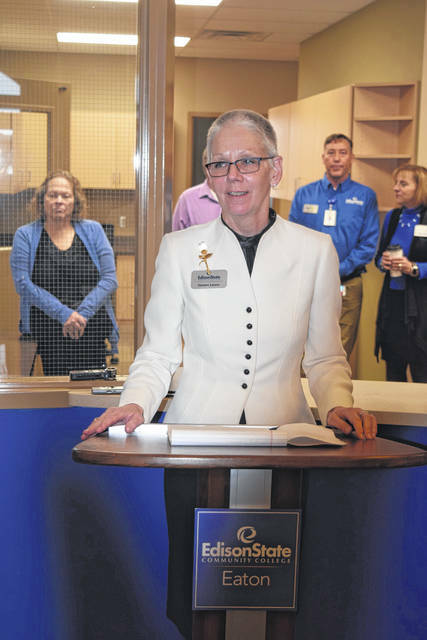 Edison State Community College President Dr. Doreen Larson welcomed the crowd to the new location and discussed the similarities between Edison State College and Preble County. 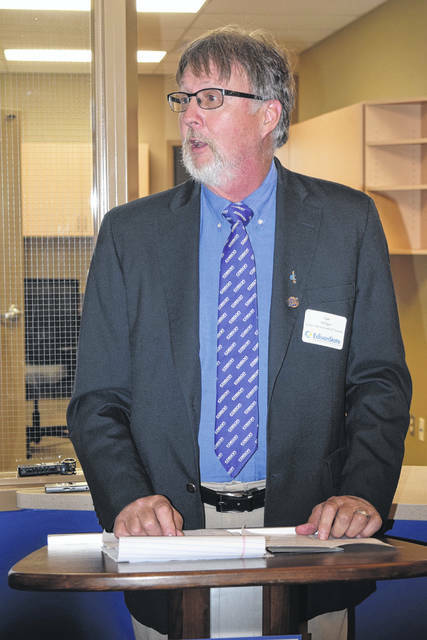 Edison State Community College Board of Trustees Chairman Tom Milligan thanked the Preble County Youth Foundation for its role in bringing Edison State to Preble County. 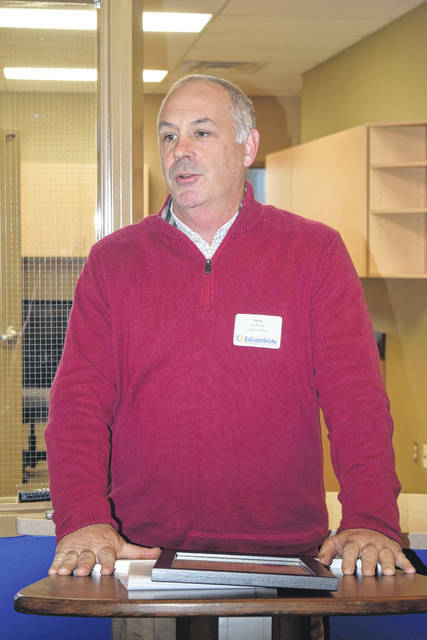 Preble County Youth Foundation President Bill Dues talked about the history of that campus that now contains Kettering Health Network Emergency Room, the Preble County Medical Center, Preble County YWCA, and Edison Community College. 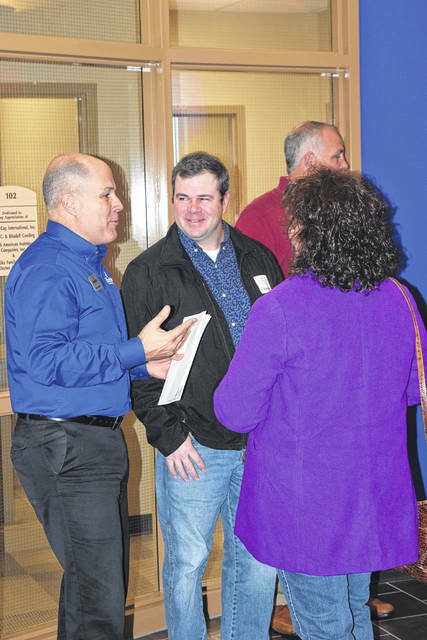 Ohio State Representative Steve Huffman was a student at Edison State for two years himself and believes in the difference the campus is making in Preble County. Senior Vice Chancellor Gary Cates presented Chancellor Randy Gardner’s first proclamation. Sam Bain, Representative for U.S. Senator Rob Portman, also presented Dr. Larson with a proclamation recognizing the achievement. 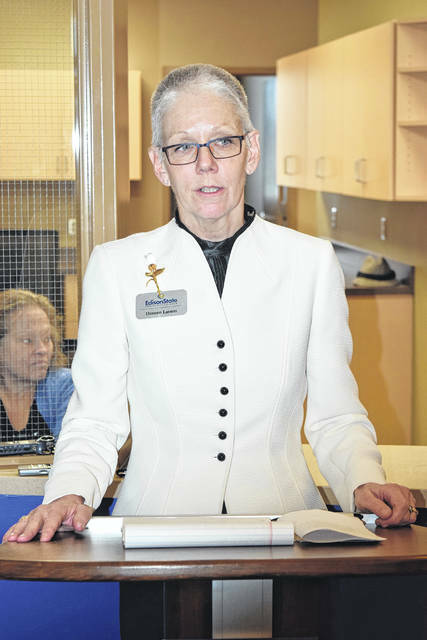 Edison State Community College held its ribbon cutting for their Eaton Campus on Wednesday, Jan. 23. The new campus is located at 450 Washington Jackson Road in Eaton, where the Sinclair Campus used to be. 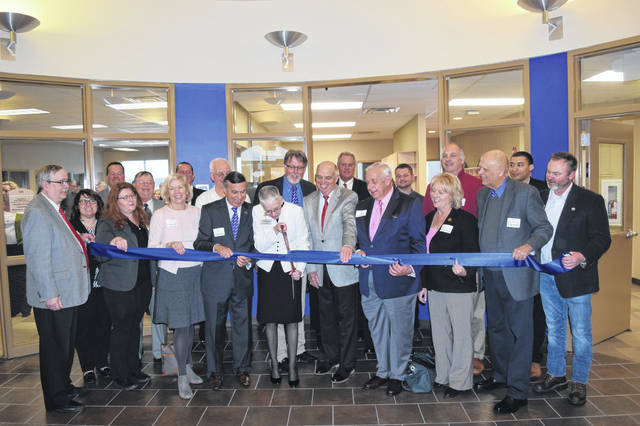 EATON — Edison State Community College held its ribbon cutting for the new Eaton Campus on Wednesday, Jan. 23. The grand opening ceremony featured speeches by Edison State Community College President Dr. Doreen Larson, Edison State Community College Board of Trustees Chairman Tom Milligan, Preble County Youth Foundation President Bill Dues, Ohio State Senator Steve Huffman, and Ohio Department of Higher Education Senior Vice Chancellor Gary Cates. 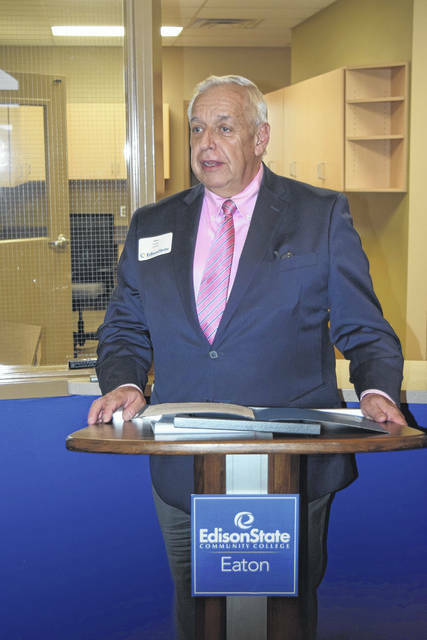 Dr. Larson welcomed the crowd to the new location and discussed the similarities between Edison State College and Preble County. “Community colleges are rooted in grassroot support. In 1973, a group of leaders in the upper Miami Valley refused to take no as an answer when they failed to pass a levy based community college. That group went back to the drawing board and they established the first State Community College in Ohio. After Edison State was created, there were eight other State Community Colleges that followed,” she said. 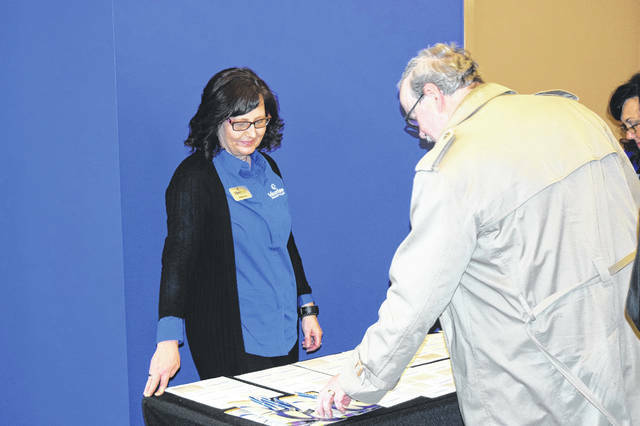 “Likewise, the leaders here in Preble County and the Preble County Youth Foundation in particular, refused to take no for an answer when they saw the critical need for a community college in this region. Overcoming obstacles, creating and leveraging new partners, pulling resources, and customizing programs, they are part of the Edison State fabric. 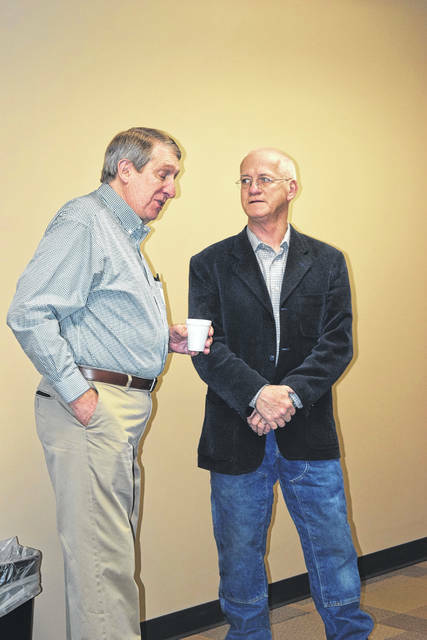 They are a hallmark, also, of the Preble County culture. Chairman Milligan thanked the Preble County Youth Foundation for their role in bringing Edison State to Preble County. He also talked about the impact that teachers can have on students and a community. “This is yet another chapter in our wonderful history. 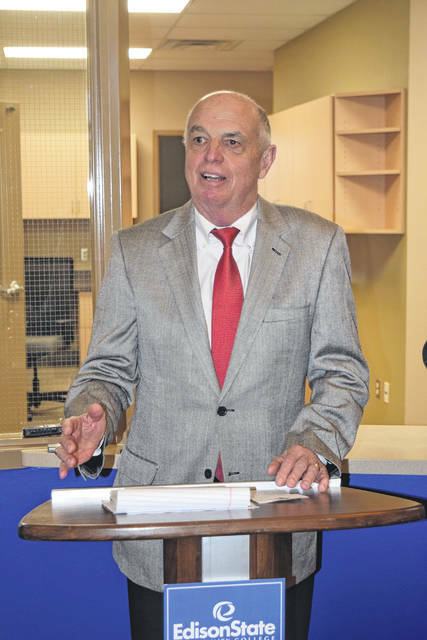 We are honored to bring a new beginning to Preble County, fulfilling the higher education void that local leadership has diligently sought to keep filled. 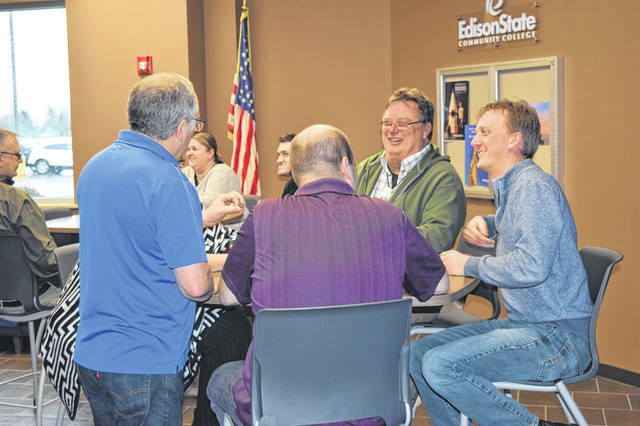 The synergies of our institution and yours — particularly our Darke County campus and the focus of our program — really makes this a great fit for Edison. 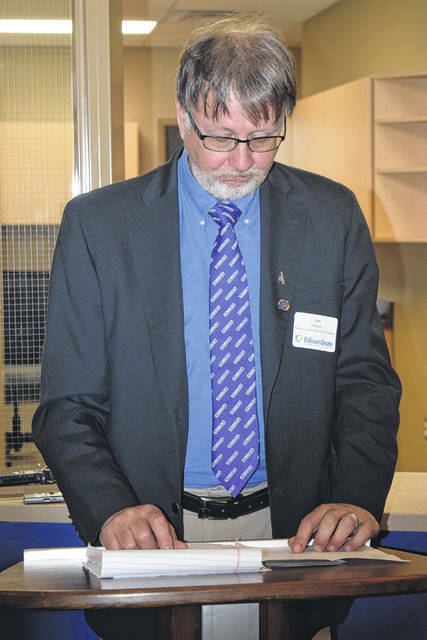 This is a great opportunity for Edison to expand its programming to a culture very much in tune with our own,” he said. 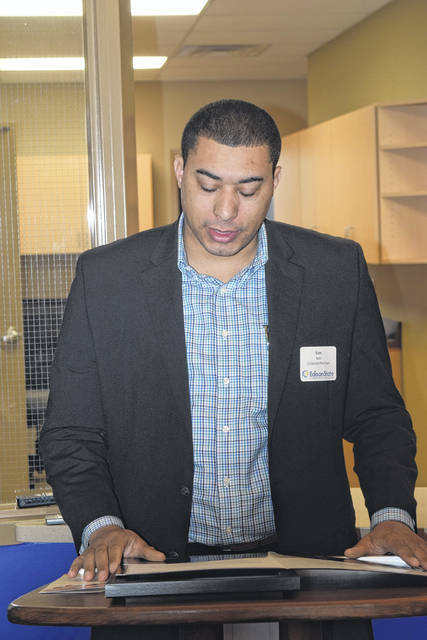 Youth Foundation President Dues talked about the history of that campus that now contains Kettering Health Network Emergency Room, the Preble County Medical Center, Preble County YWCA, and Edison Community College. “This whole campus started a long time ago. We started the Preble County Youth Foundation with the idea to give the people in the community some place to go. We wanted a teen center and that didn’t work. 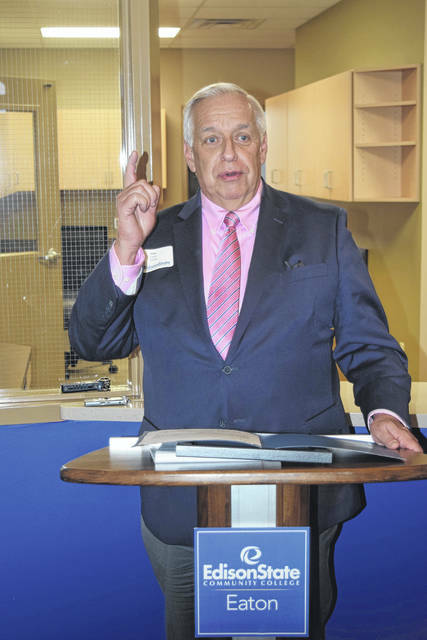 There are failures in that road to success, we once opened a chicken factory and wanted to turn it into a teen center, but it failed – luckily, because several years later we had the opportunity to partner with YMCA and at that time Grandview Hospital,” he said. “The YMCA with their demographics told us that we needed to build a facility for 700 members of the YMCA. Shortly after they opened, we went to over 2,000 members and have been able to maintain that with the YMCA staff. Their dream and Grandview’s dream that became Kettering’s dream from a small medical center and a few doctors to every specialist that you could want, a state of the art emergency center, and a helicopter in case you need to get somewhere other than Preble County. “Those dreams flourished because those two partners embraced Preble County, got to know Preble County, and serve Preble County. What makes me so excited today, is in my very limited contact with Edison State Community College, I have the feeling that they are going to take their educational system, their willingness to work with the local people, and the local community and the local leaders, and bring the quality educational system that they have [to Preble County]. Senator Huffman was a student at Edison State for two years himself, and believes in the difference the campus is making in Preble County. “The great things you did in Darke County, you’re not going to duplicate here, but what you are going to duplicate is fulfilling the need and providing great education for Preble County. I would also like to say great things about the vision for this campus. 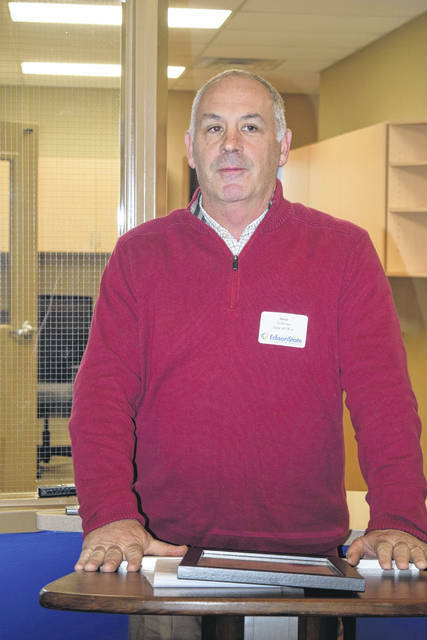 I work at the Emergency Room here and the vision of the people of Preble County to be able to say, ‘We need this medical facility, we need the YMCA, and we need this education,’ I want to applaud the things you are doing in the county for the youth,” he said. Sam Bain, representative for U.S. Senator Rob Portman, also presented Dr. Larson with a proclamation recognizing the achievement. The Ohio Representatives Office also sent recognition to Edison State. The new campus is located at 450 Washington Jackson Road in Eaton, where the Sinclair Campus used to be. For additional information on careers or programs, contact Erica Wentworth at 937-548-5546.